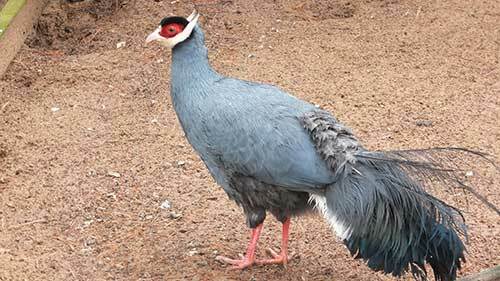 Description: Blue-eared pheasants are medium sized birds with blue feathers on their bodies and long white “ear” feathers (coverts) that grow up from the chin and cover their actual ears. Tail feathers are loosely curled with dark blue/grey tips. Both males and females have reddish legs but males have larger, rounder spurs. 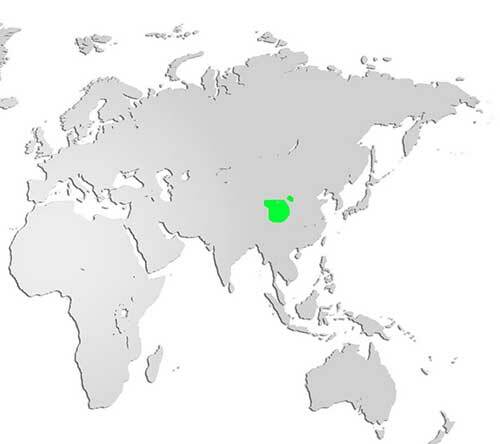 Distribution and Habitat: Commonly bred in captivity, the natural range for blue-eared pheasants is in the high altitude coniferous forests of central China. Diet: Like other pheasants with heavy beaks, blue-eared pheasants dig for grubs, insects and roots, which may destroy plant life in their habitat. Life Cycle: Young birds may find a mate in their first year but, may not have a successful brood until they are two years old. Clutches of 6–8 eggs are incubated for 26 days, sometime between April and June. Did you know? The remoteness of its native range is likely the reason the blue-eared was one of the later pheasant species brought to the western world.